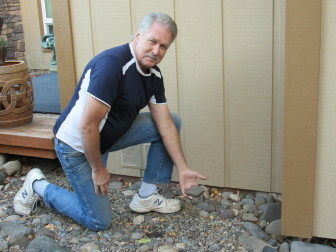 Ashland homeowner Doug Kay shows how he replaced shrubs near his home with rock as one way to help protect it from wildfire. Kay has also ringed his foundation with rock and screened his roof gutters to prevent leaves from accumulating there. Kay and his wife Rebecca bought their house in 2010, just a year after a fire burned its way over a nearby hill, showering the neighborhood with hot embers. He points to the crest, less than half a mile away, where blackened trees can still be seen. That sense of vulnerability led Kay to spearhead an effort in his neighborhood to join the FireWise program. It’s a national program to help homeowners take steps to create non-flammable buffers around the home. 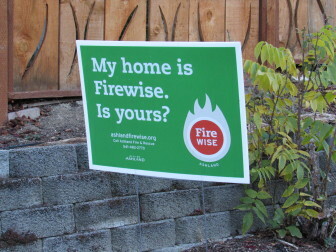 But while FireWise may help homes survive a wildfire, economist Ray Rasker says it’ll take a lot more than that to keep the cost of fighting fires from continuing to spiral upwards. Rasker is executive director of Headwaters Economics, a non-profit research group in Bozeman, Montana. He says one factor in the sprawl into fire-prone areas is a fundamental disconnect. This year, the Forest Service and other federal agencies are expected to spend about $2 billion on fire suppression, more than four times as much as in the mid-1980s. Ray Rasker’s group helps local planning officials use a mixture of regulations and incentives to discourage unsafe development in fire-prone areas. He says doing this in Summit County, Colorado proved very cost-effective. Headwaters is urging federal agencies to establish a grant fund to help local governments do this kind of planning to avoid sprawl into areas where fire is likely. Katie Lighthall says she understands this often isn’t the top priority for local officials . Lighthall is the western regional coordinator for a federal initiative to find solutions to the growing wildfire problem. She says the time is coming when folks who build on the edge of the forest will find they do so at their own risk. That means local officials are going to have to put the brakes on development in fire-prone areas. Joe Stutler, senior advisor to the Deschutes County government on wildland issues, says officials across the West are starting to accept that reality. Stutler says there’s a growing consensus around three basic principles regarding fire. In the end, success may hinge on whether we can come to see fire as a natural, even necessary, part of living in the West.